Food & Wine's Editor in Chief Dana Cowin shares her #howisummer plans, from eating oysters in Portland, ME, to riding bikes in Dutchess County, NY. F&W is celebrating the season with the #howisummer hashtag. Include it in your Instagram posts for a chance to be featured! When we launched #howisummer last year, I was amazed to see the power of summer traditions. Instagrammers tagged more than 18,000 photos: drippy ice cream cones, magnificent lobster rolls, glamorous beaches, secret swimming holes. Check out @fwscout on Instagram and Twitter to see what I’m up to—and please use #howisummer to share your own experiences. The dot-size hamlet of Wassaic is the last stop on Metro-North’s Harlem line. 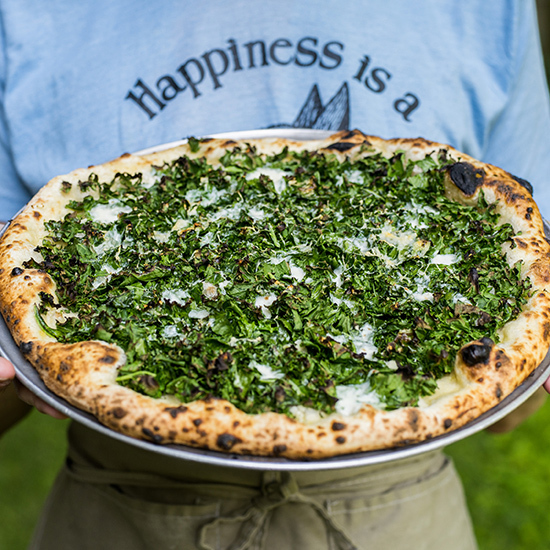 Here, Jeff Barnett-Winsby and Bowie Zunino have transformed an old bar into The Lantern, a spectacular wood-oven pizza place that uses a dough recipe from a former chef at Roberta’s in Brooklyn. With Eve Biddle, they are also cultivating an artists’ community on their farm, with a residency program and visual-arts shows in a converted grain elevator and auction barn. Every year my family and I go to The Wassaic Project arts festival (July 31–August 2) to walk through the studios, listen to music and check out the farm. My daughter, Sylvie, and I like to get on our bikes in Wassaic and ride the rail trail to Amenia, where we go to our favorite café in the world, Back in the Kitchen. The owner, Peg McEnroe, makes croissants that are the perfect ratio of crackly top to fluffy inside. From Amenia, Sylvie and I bike up to Millerton, where my husband and son meet us. The three of them peel off to get a chai at Irving Farm, a coffee roaster, while I go straight to Hunter Bee, an antiques store that has been the source of countless gifts for friends: ceramics, illustrations, midcentury furniture. We reconvene at the Harney & Sons tea shop, where we stand at the counter and do tastings of some of their 250 varieties. Thanks to the Food & Wine Classic in Aspen (June 19–21), I’ve been to this extraordinary mountain town 20 times. Twenty! I arrive a few days before the event begins so I can bike the Rio Grande Trail and stay a couple of nights at the Hotel Jerome. Then I move on to the St. Regis, where Food & Wine is the creative force behind a restaurant called Chefs Club. It showcases signature dishes from a rotating series of four current and former Best New Chefs; a dinner there is like taking a tour of the most exciting restaurants in the country without leaving Colorado. Once the Classic begins, I go nonstop. Late-night, I swing by The Little Nell hotel, knowing that I’ll invariably run into friends pouring outstanding bottles. Wine director Carlton McCoy is an incredible host. For the past few years, my kids have gone to camp in Freedom, Maine—home to 719 people and the amazing restaurant The Lost Kitchen. Before camp begins, my daughter and I rendezvous in Portland and walk every inch of the city (it’s a small city), looking for great food and fun design shops. Last year we had virgin cocktails at Vena’s Fizz House, bread at Standard Baking Co., oysters at Eventide Oyster Co., puffy pizza at Slab, duck-fat fries at Duckfat and finally an elegant dinner at Vinland. All in one day! There are stops at Angela Adams’s rug shop and K Colette’s dreamy lifestyle store in between.